To get the correct fit we have to measure in the correct place. 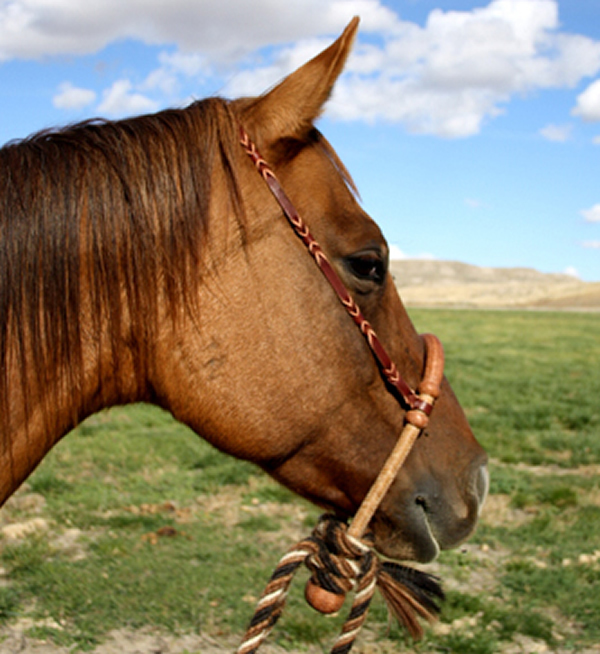 The Hackamore should sit about halfway between the bottom of the eye and the top of the nostril, and about halfway up the jaw when it is pulled tight with the mecate tied on. So, take a string and circle it around the nose at those two points, then measure the length of the string. The average riding horse will measure around 22 to 23.5 inches, so if we use a little cowboy math and some experience we come up with the measurement between the inside of the noseband and the inside of the heel knot. Allowing for a mecate that is the same diameter as the Hackamore, and the use of 3 or 4 wraps (which includes the reins and lead), here are the regular sizes for the different diameter Hackamores and Bosals. So, if your horse falls in that 22 to 23.5″ range order the regular size. For every additional 2 inches to the circumference of the horses nose, 1 inch of length is added to the length of the Hackamore or Bosal. These can be special ordered if not available in the required size. A wide range of horses will have the same size of muzzle even though the length of their head may differ, but this quick measurement will tell you. Our hangers are going to fit horses 45 to 50 inches from one bar of the Hackamore to the other. Let us know if that measurement is going to be excessively different and we can accommodate any length.